We are passionate about delivering value by developing innovative and user friendly apps. If your looking for an app that is constructed with great design and powerful performance, then we are the company for you. Poor construction and execution of an app results in a high rate of rejection. Our experience and expertise allows us to prepare the best strategy for your smartphone development process. We are knowledgeable of what’s in-demand for apps and always use the latest components in our final builds. When you work with us, you’ll have full access to every stage of the process. The team of our strategy experts indulges in meeting, consultation and discussions with the visionary minds behind your mobile app’s ideation. With several brainstorming sessions and blending of our technological know-how with your raw ideas, we devise a route-map to a futuristic and remarkable product. We swear by creativity and thrive on your feedback. When it comes to create UX and UI Design, we bring forward the aces of our team, dedicated to prompt you with futuristic look & feel and functioning of your mobile app. To make this happen, we make the best use of our creative excellence and engineering capabilities. Before making the UI, we start with prototypes and wireframes of the app, which are basically the raw sketches, enabling us to see how the envisioned app would look. We use distinguished tools invision, Balsamiq etc. to draw the prototype, ensuring quality at every step. This approach allows us to check how all the buttons; tables and forms in the app would look like when the actual design is created. This approach enables us to see a rough version of the app. Once it is approved, our creative brains go ahead to create a UI that is visually appealing, powered by smooth navigation and simplified user experience. We are ranked amongst the most credible mobile application development services in India because of the hands-on expertise we imbibe and the way it reflects in the solutions we deliver. App development is our collective passion. We know the secret of development flawless mobile applications. We focus on creating mobile apps, which are super fast, lightweight UXs and optimized UIs to deliver memorable user experience. It has lightweight frontend to ensure long battery life. We believe mobile application development is not merely a process but a culture that is ever changing and ever-growing. This is the culture that needs to be nurtured, protected and matched upon, to let it unleash its maximum potential. Our team of experts is dedicated to achieve the same. We believe in delivering flawless mobile app development, product strategy, native application development, custom application development and backend services. These efforts have made us amongst the most preferred mobile app development company in India and we strive to grow beyond that level. The world of mobile app development is quite challenging. Developing a full-fledged app is huge investment in terms of time, money and resources. Isn’t it great to have a way that identifies the potential success of the app that you are investing in? even if you are a startup or an established brand, sometimes the brilliant of the ideas bounce back! So why not test the potential of your idea with a smart approach? Minimum Viable Product (MVP) is a recommended approach, where you need not to go ahead with the full project until you test its ability to get you expected tractions. The results are based on real time data and are tested with real users rather than estimated speculations. Interesting, isn’t it? The approach enables you to focus on core features instead of wasting time on fancy and unimportant ones. 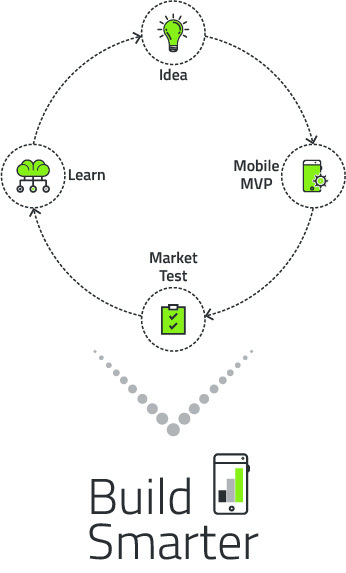 With Mobile MVP, you can get a core minimum viable product developed for your mobile and test user response and get their feedback. Once the MVP is getting you the expectated results, you can go ahead and invest in full package. It also helps you understand how your app is serving the targeted user and what changes are required to make it more effective. Do you have the next big idea? Lets bring it to life! © 2018 NBN MINDS. All Rights Reserved.